Welcome back to the Five Days of Christmas, today we made a card. I used the winter flake dies and a sentiment from the warm holiday fun set. Nice Snowflake Card! Love the color combination you used. What a Beautiful Card!! Your background is so pretty and definitely showcases the sparkly snowflakes in a magnificent way. You so did a Super Outstanding Creative job!! YOU so ROCK!! So pretty with all of the snowflakes. Wonderful card! 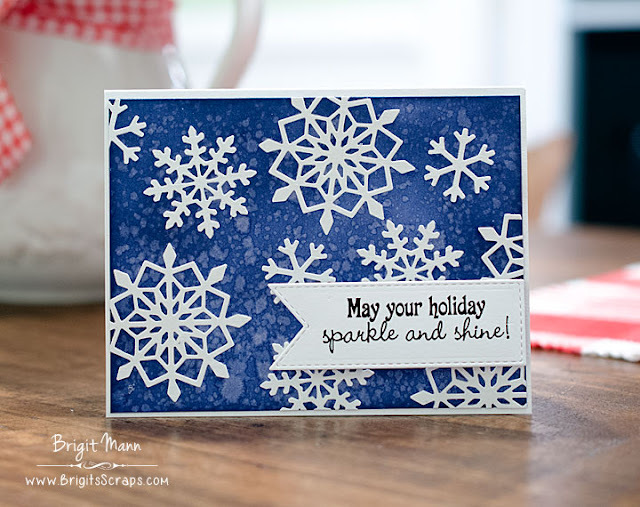 Love the bright snowflakes that really pop on the background you created! Beautiful! The background looks fabulous with the white flakes and sentiment label. Great card! I ALWAYS love blue for Christmas cards! This is awesome!!!! A very pretty card. I have never tried making a Christmas with non-traditional Christmas colors. I love it. Thank you for sharing. Pretty card...Love the background and the snowflakes.